Marshall is a long-time leader in rigging for fine arts. We have handled some of the most well-known, some of the largest, some of the most demanding works of art in the business. 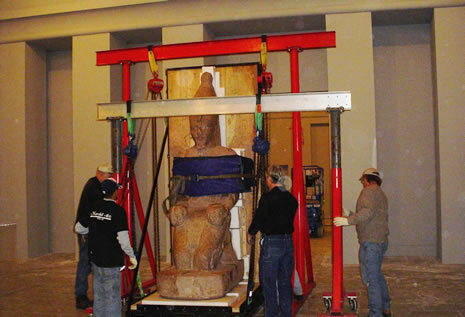 Over the years we have developed a level of familiarity with large objects and a collection of customized equipment that enables us to lift monumental works of art, regardless of size, shape, or materials. We have developed an enormous array of techniques for dealing with each of the unique situations that come with each different work. MFA is also skilled at hoisting large works of art into locations high above ground. We have years of experience at (and an array of custom-built equipment for) moving art objects into and out of high-rise buildings. Plus we know how to handle the complex permitting and regulatory challenges that come with these kinds of jobs. CLICK HERE to contact Marshall on fine art rigging requirements or questions.